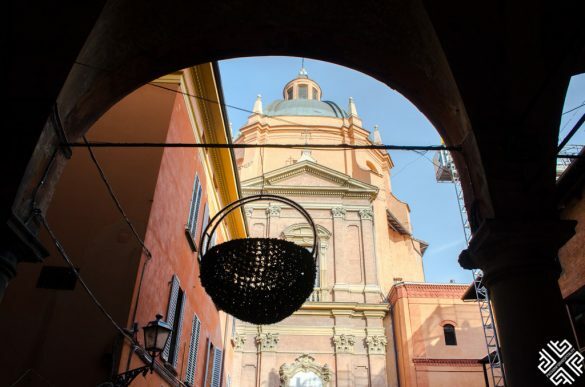 If you want to indulge in the best Italian food while admire gorgeous architecture along the way, then a Bologna Food Walking Tour with Amazing Italy should definitely be added to your Bologna itinerary. When travelling to a new destination, I believe that the best way to learn about the food and culture of a city is by joining a food walking tour. 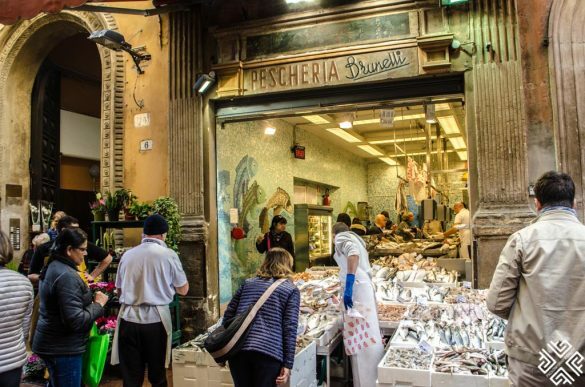 I have been on quite a few city food tours over the years, and I highly recommend this experience whether you are traveling alone, with family or friends. Our Bologna food tour started on the main square of the historical city — the Piazza Maggiore which is rather compact yet dominated by a profound mix of architectural gems. 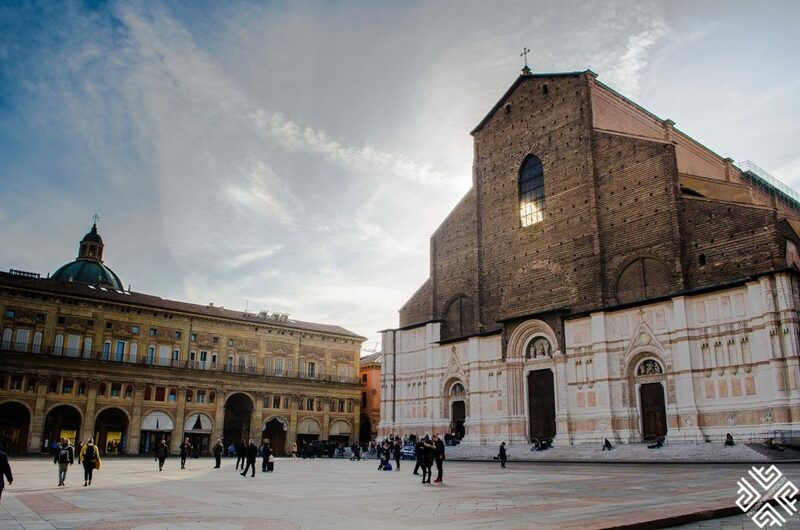 The first and foremost is the grandiose Basilica di San Petronio— completed in Gothic style, this monument is the tenth largest church in the world. 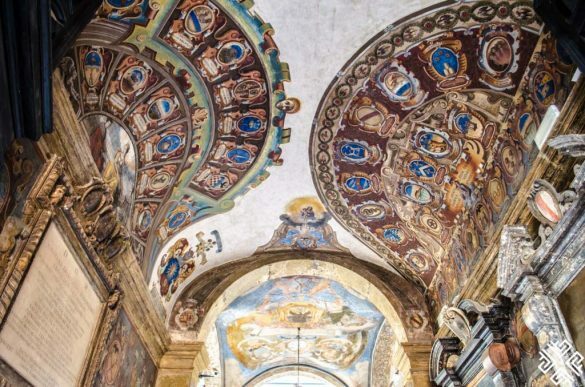 In fact, it was supposed to be grander than the Saint Peter’s Basilica in Rome, to prevent this the University was built on one of the side streets. Of course no one would touch the University building to expand the cathedral. 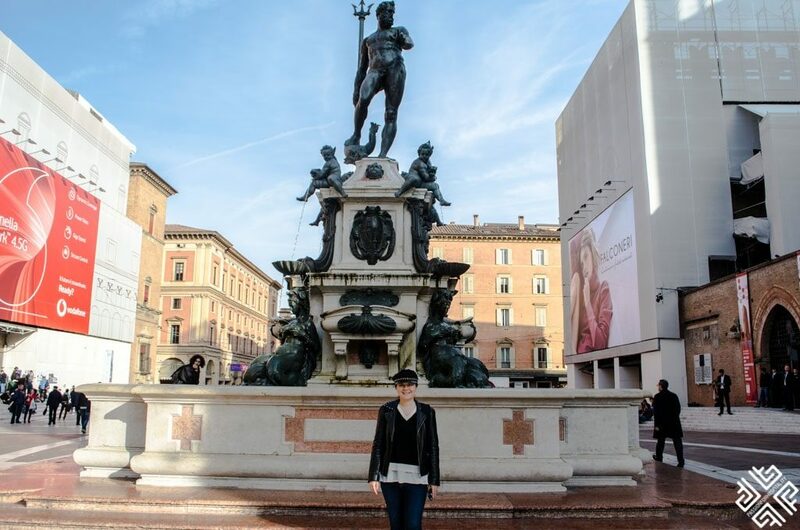 Another important landmark that you will absolutely not miss is the Fountain of Neptune (Fontana di Nettuno) which stands on a small square — which has been named after this remarkable creation. The fountain represents a symbol of power — like the Pope who was the ruler of the world, the Neptune was the master of the seas. The four angels which decorate the base of the statue depict the four rivers of the continents — the Gange, the Nile, the Amazon and Danube. If you will look closely — the trident that the Neptune is holding has inspired the logo of the Maserati car company. 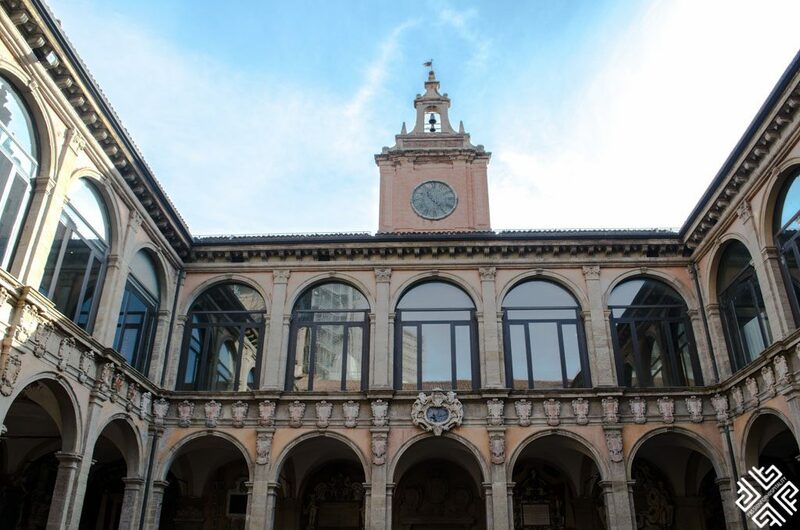 On the right hand side of the Piazza Maggiore you will find The Palazzo Comunale which is the Town Hall — in the first half of the fifteenth century it was enriched with a clock tower which stands until this day. 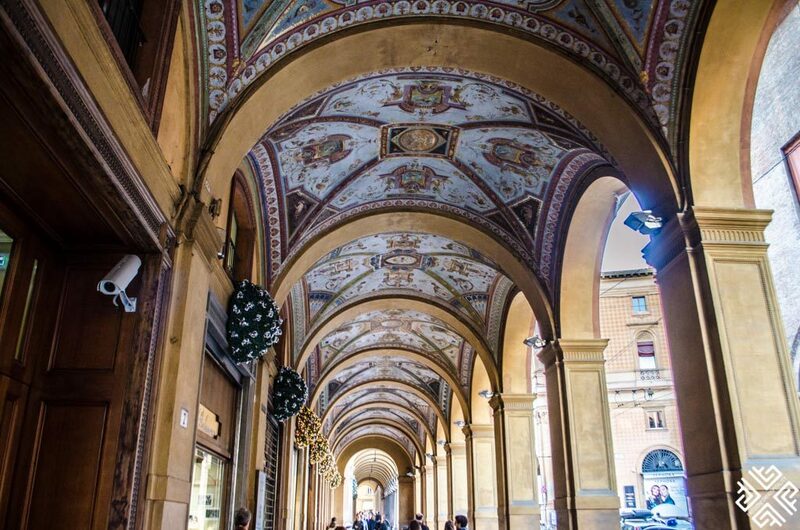 Right across your eyes will fall on the beautiful facade with the pretty arches which is the Palazzo dei Banchi — it was built to cover the narrow market streets. Bologna is a city know to have three nicknames — la rossa (the red, famous for its red buildings and the birthplace of Italy’s political left party), la dotta ( the learned one, because of the universities) and last but not least la grassa (the fat one — because of its renowned cuisine). Back in the days being fat was considered a sign of wealth. 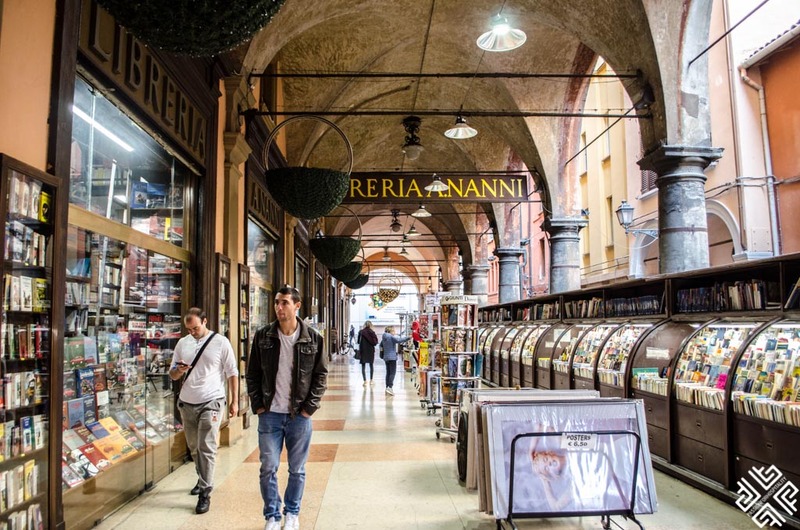 As we progressed further inside the picturesque streets of Bologna’s historical centre we passed a store that actually features the remains of a historical building. A few steps further we reached the first stop of our Bologna food walking tour which was a gorgeous traditional chocolate store. Italy’s love for cocoa goes back to the late sixteenth century when these exotic tastes were imported into Europe by the Spaniards. This rich in flavour drink was quite popular among the popes and kings. Following several conquests and clashes among the ancient kingdoms — during the time when Bologna was occupied by Napoleon’s troops and the city became part of the French Cisalpine Republic in 1796, that’s when the first sweet store opened its doors. 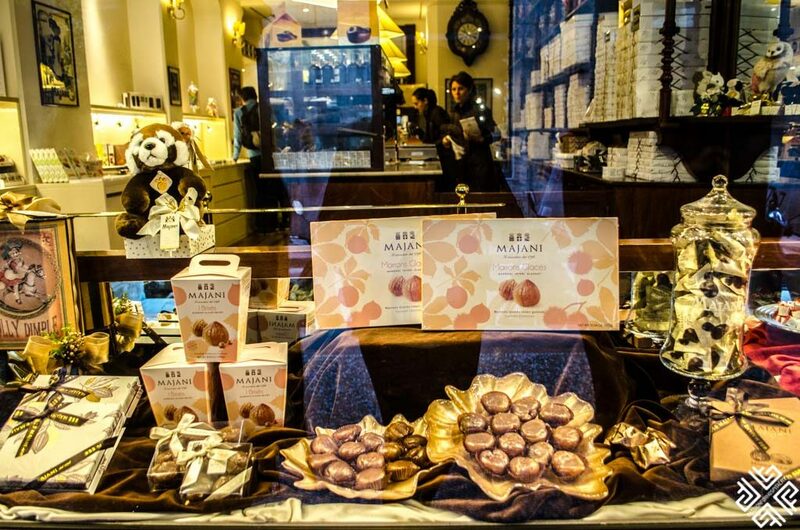 The first Italian chocolatier became a popular meeting place for Bologna’s high society. 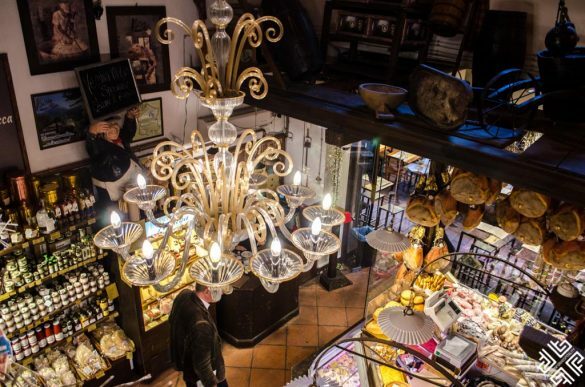 With over 220 years of history this beautiful chocolate store continues the family’s legacy of producing high-quality chocolate. During our tasting we tried four different types of chocolates — the sfoglia nera based on the first recipe which was produced in 1832, made out of 51% cocoa (using the finest cocoa powders) it has a unique wrinkled shape, the Fiat chocolate which represents the most prestigious product launched in 1911 it features 4 layers of roasted almonds and hazelnut. The third chocolate is the recent creation made in 2006 which is shaped like a classic tortellino however a sweet version of a Classic Bolognese pasta dish. It is produced in three versions — milk, dark and white chocolate. 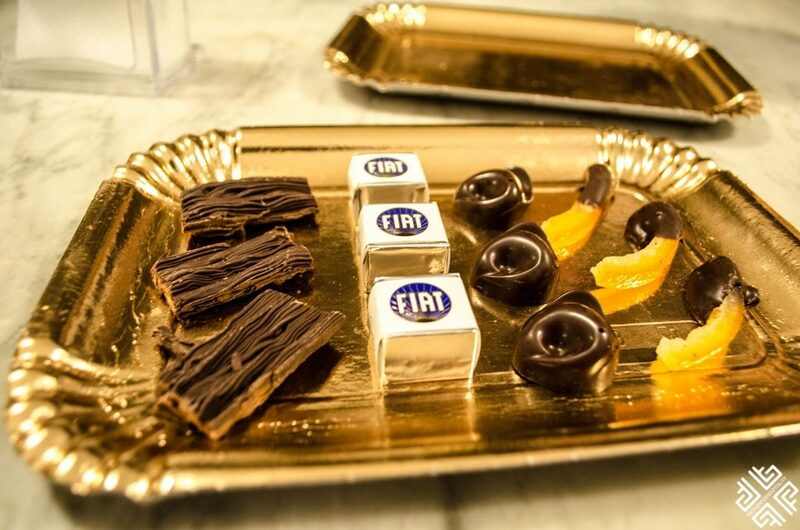 The fours sweet delight which we tried is a modern version called oranchino, made from orange peel, dipped in dark chocolate. 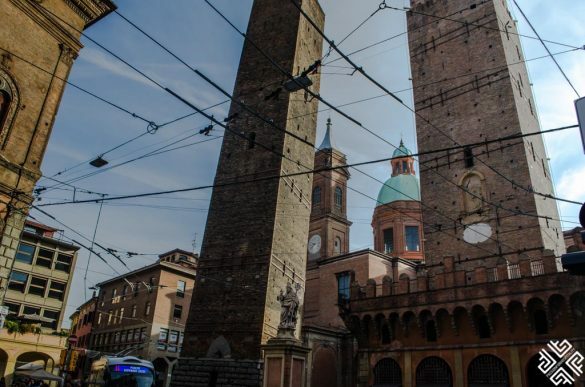 We then traversed through the narrow streets of Bologna passing one of the famous towers of Bologna — the Galluzzi Tower built in the 12th century by the noble family of Bologna. 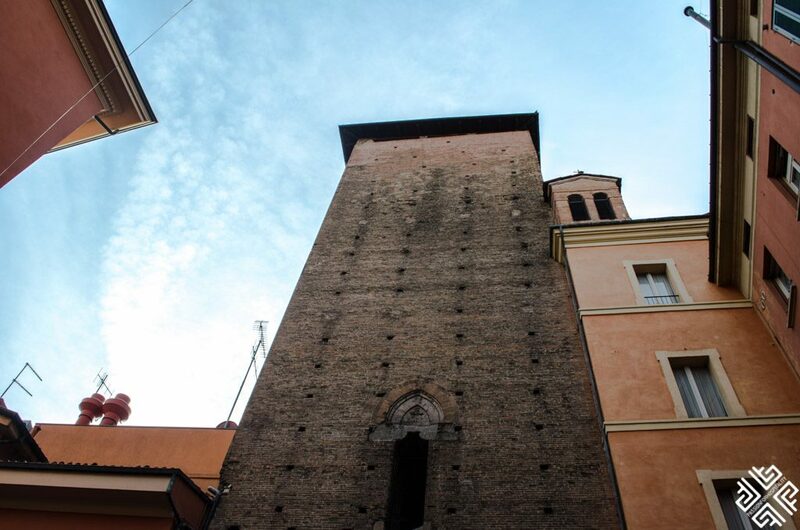 Today this medieval skyscraper of Bologna is somewhat 30 meters tall, it was reduced from its original size. 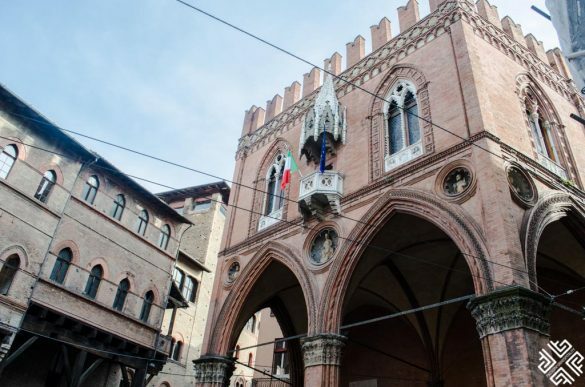 Like in the famous love story of Romeo and Juliet — a similar love story happened in Bologna between two rival families the Galluzzi and Carbonesi. The son and daughter of the two most powerful families in Bologna got married against their families’ will — the result Alberto was killed and Virginia hanged herself from the Carbonesi’s window. 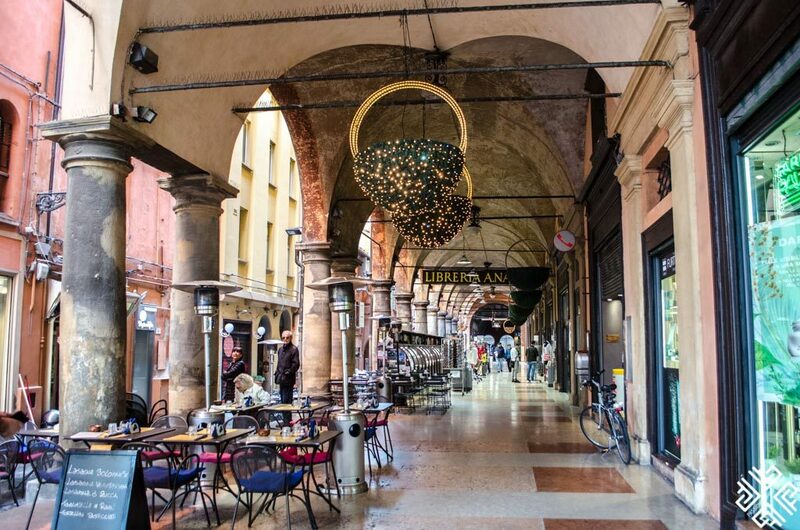 Up next you will come across the Piazza Galvani which is located behind the Basilica di San Petronio and right in front of the entrance of the Palazzo dell’Archiginnasio which was initially built to house the University therefore the extension of the church did not take place. 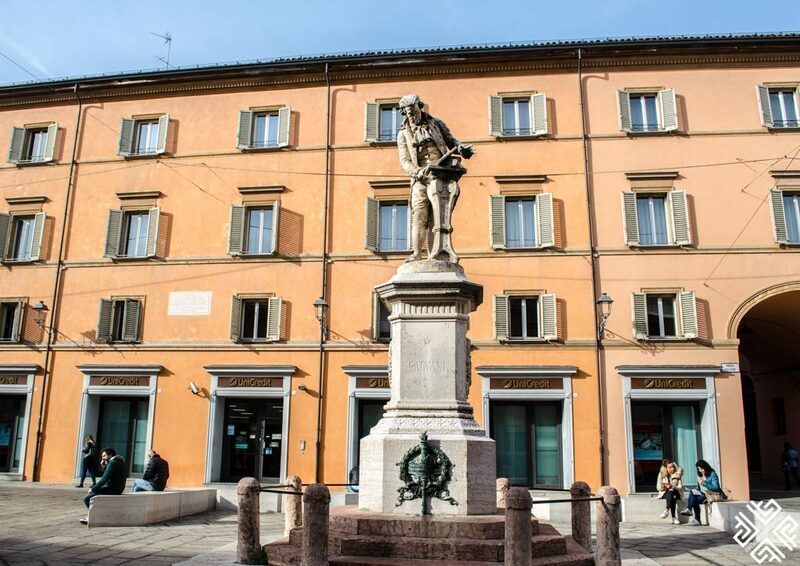 In the centre of the square you will encounter the famous statue of Luigi Galvani (bolognese scholar who discovered bioelectricity while observing a frog) completed by Adalberto Cencetti. 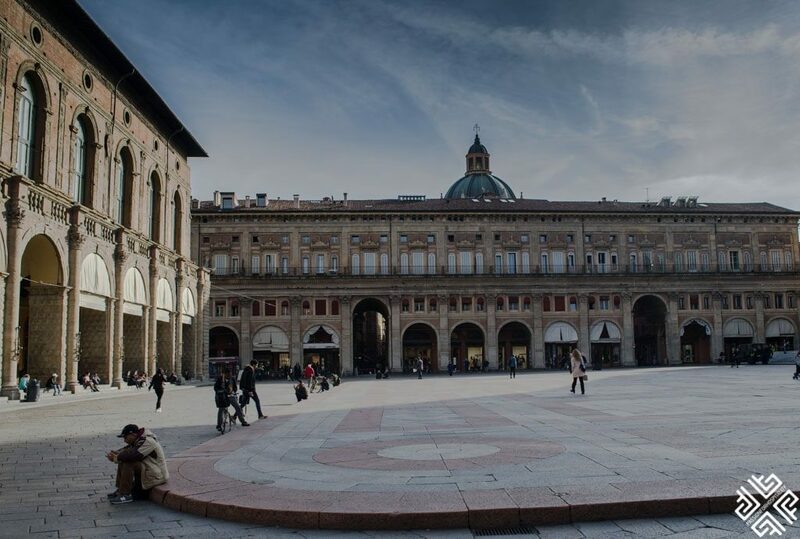 Over the years the square was given various name until the final name of Piazza Galvani was given in 1871. 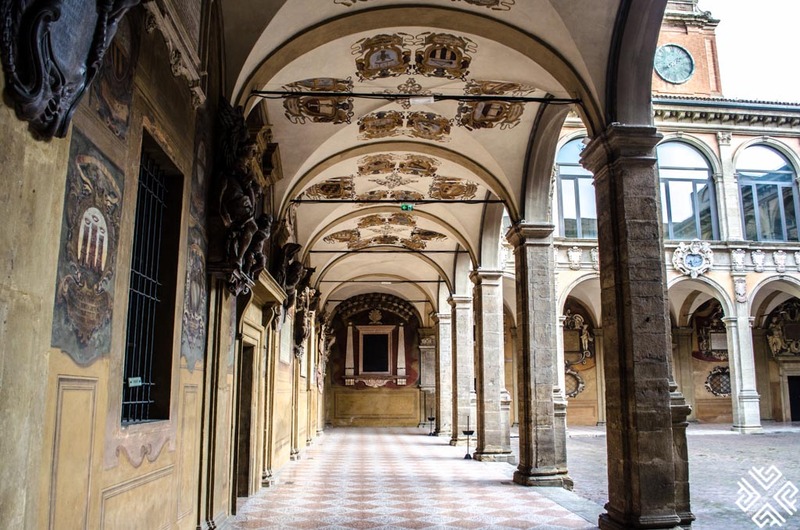 After a brief look at the courtyard of the Palazzo dell’Archiginnasio we turned the corner of the gorgeous portico that belonged to the Ancient Hospital of Death (it used to be a popular meeting point among medical students who studied anatomy in the nearby Palazzo dell’Archiginnasio). Inside the portico you will come across the oldest book store of Bologna until you finally reach the steps that lead to the front of Santa Maria della Vita church. 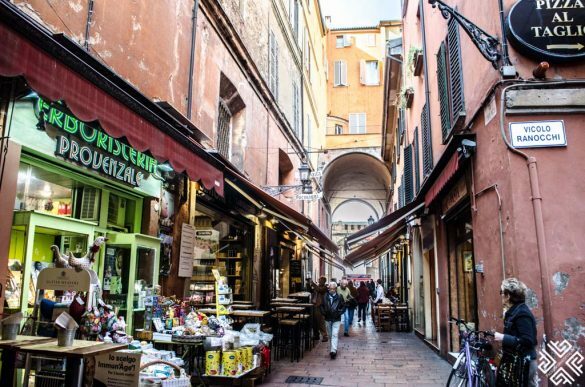 This part of the historical city of Bologna is rather charming as it is dotted with colourful stalls selling fresh fruits, vegetables and fish. 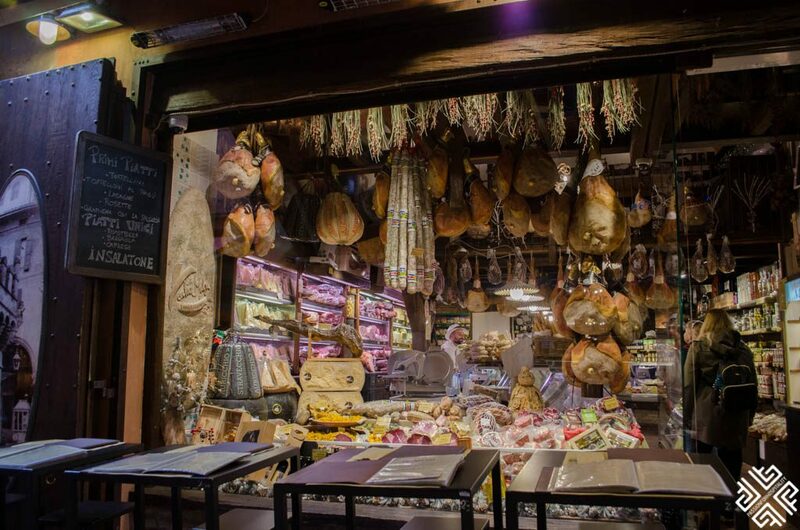 Here you will also find a generous selection of prosciutto shops that also have a dedicated area where you can savour these traditional Italian delights. 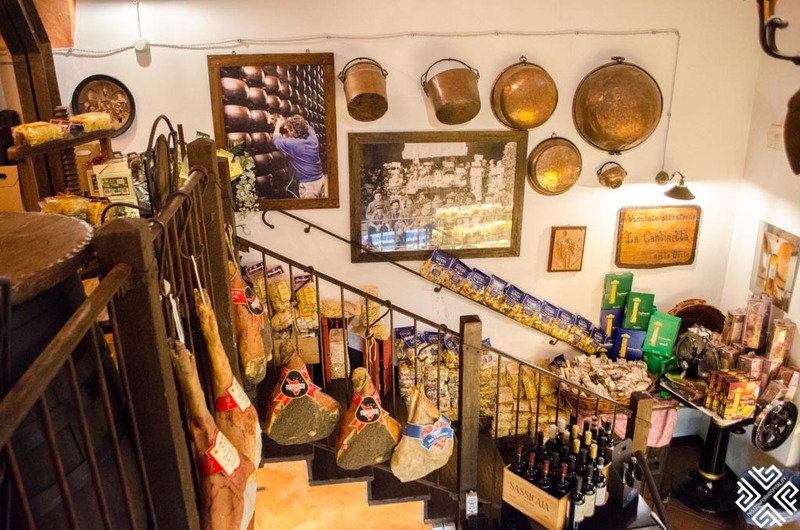 A few steps later after admiring the picture perfect stalls we entered the house of prosciutto, cheese and wine. Here you will get lost in the selection of delicacies and aromas which are laid out in front of your eyes — we followed Elena our guide upstairs to a charming dining room from where a hanging chandelier illuminates the lower level of the store. 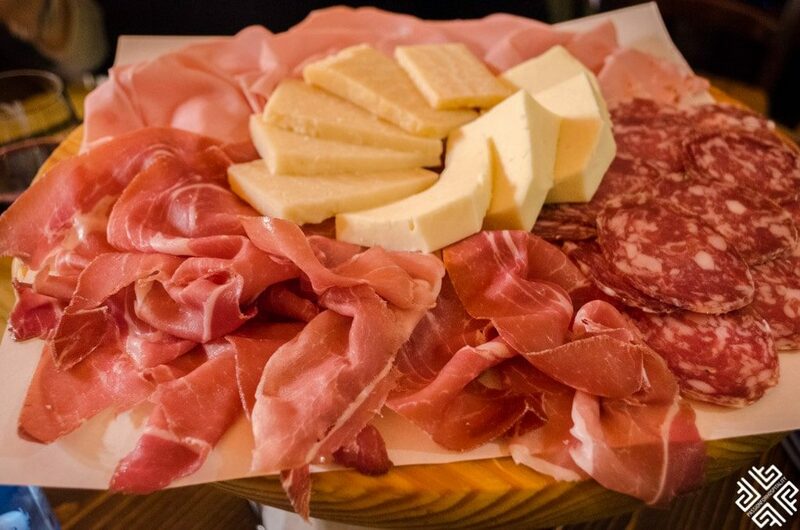 It was time to taste prosciutto, salami and mortadella along with parmigiano reggiano as well as caciotta cheese, which is a young cheese made from milk of cows, sheep, goats or water buffalo and goes particularly well with cold cuts. The beautiful platter of cold cuts and cheeses was paired with a tigello bread, which is a round pancake type of bread which is served hot. We paired our tasting with a glass of Lambrusco (sparkling red wine famous in the Emilia-Romagna region). The third stop of the bologna food tour was for lunch at a very popular homemade pasta maker which gets very busy during lunch break hour. 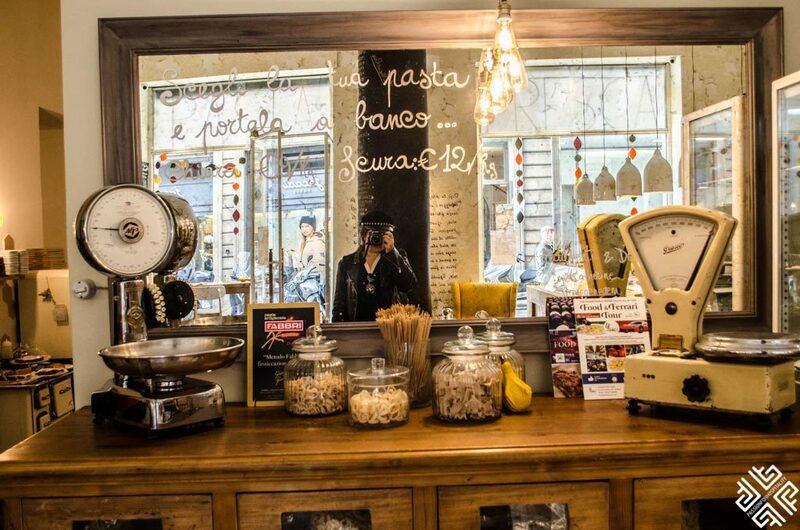 The store was established in 1963 and here you can buy fresh made pasta which you can prepare at home or enjoy a plate inside the store. 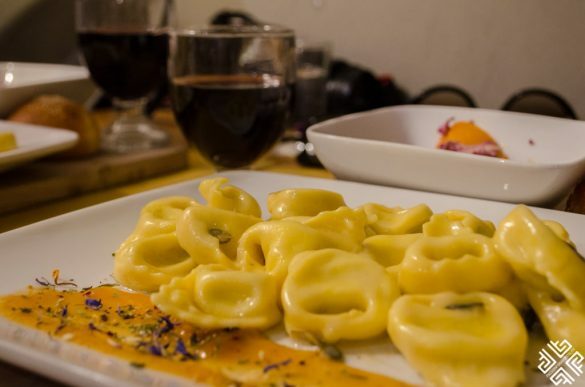 There is a traditional menu and a weekly menu which offers a selection of hearty pasta dishes. 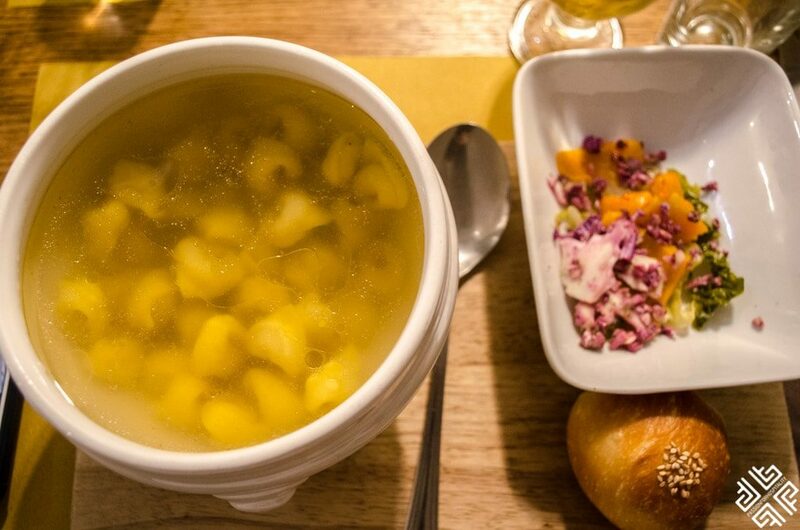 I decided to try the Tortellini in broth which is a staple dish found in Bologna. 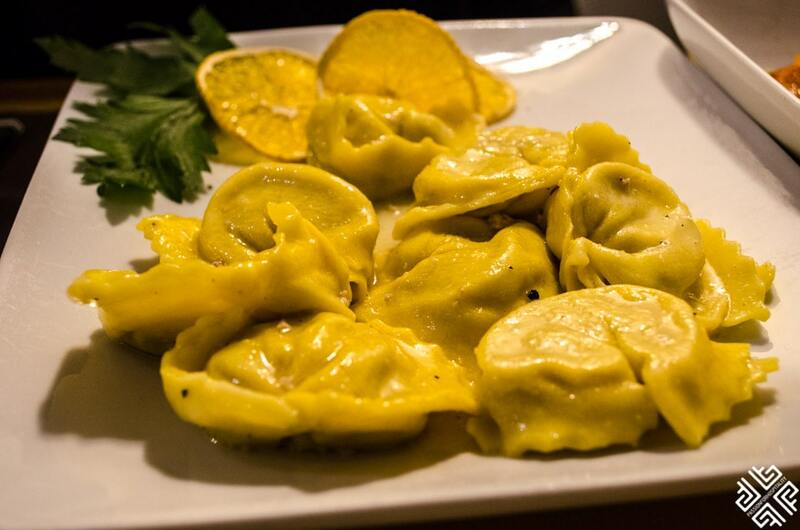 There is a popular legend that the shape of tortellini has been inspired by Venus’ Navel. After a hearty bowl of tortellini and a glass of wine we continued our tour passing by the famous Two Towers of Bologna and the Chamber of Commerce building which houses the original recipes of Bologna. 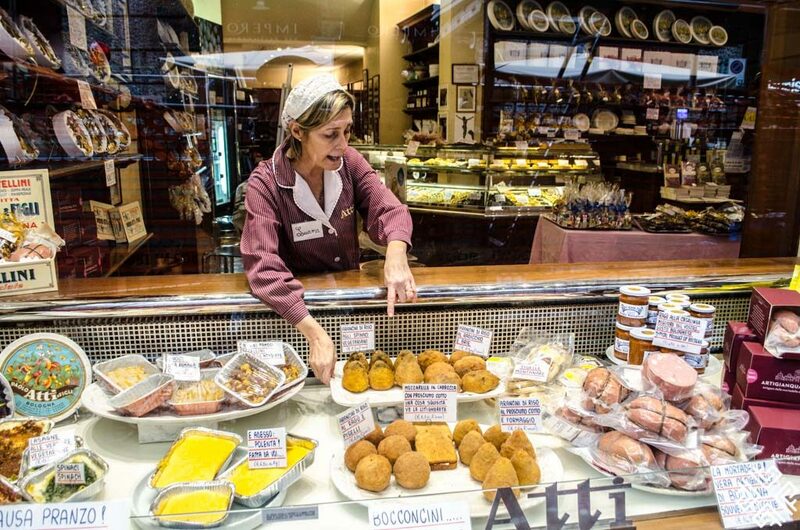 The next stop was a traditional Bolognese bakery which has been around for 150 years. In fact as we approached the window display, I noticed an elegantly dressed lady give instructions to her employees on how to hang the 150 year gold sign — she watched the process carefully, giving comments in Italian. Here, we satisfied our sweet tooth a typical Bolognese dessert which is a rice cake made of almonds, rice, milk, eggs and orange or citrus flavour is usually added. This traditional cake is usually served as a celebratory cake and is popular during Easter time. 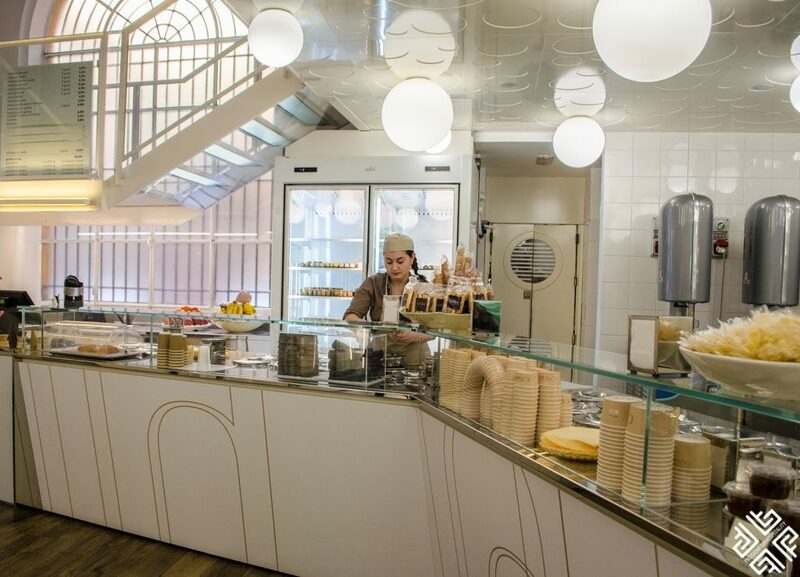 The final stop of our food tour was for the famous Italian gelato — in a modern Gelato store located near the high end stores of Galleria Cavour. The choice of gelato is endless with a selection of special, classic and fruit flavours. Here you will find names of gelato inspired by the landmarks of Bologna. I opted for the lighter version of flavours — blueberries and pink grapefruit served in a crunchy cone. Delicious! 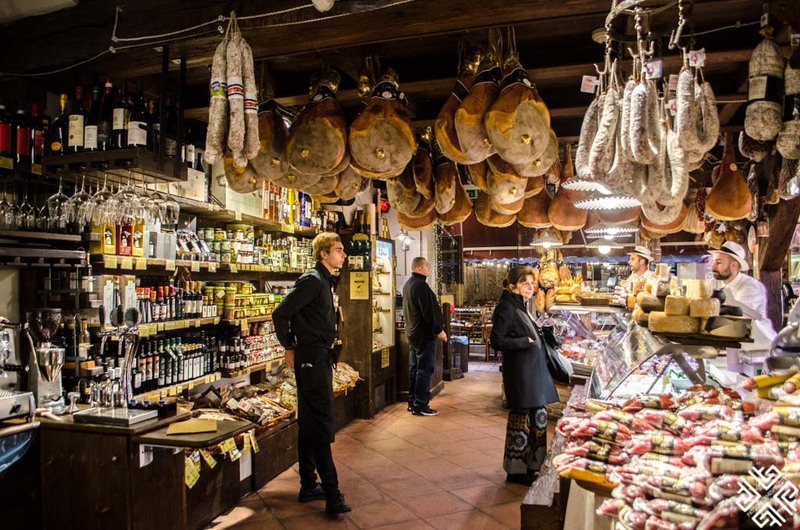 During the 3.5 hour Bologna food walking tour we not only learned all about the highlights of the historical city of Bologna but we were also introduces to the famous dishes of this foodie capital of Emilia-Romagna. If you love architecture, history and food of course — then this tour will definitely satisfy your wanderlust. 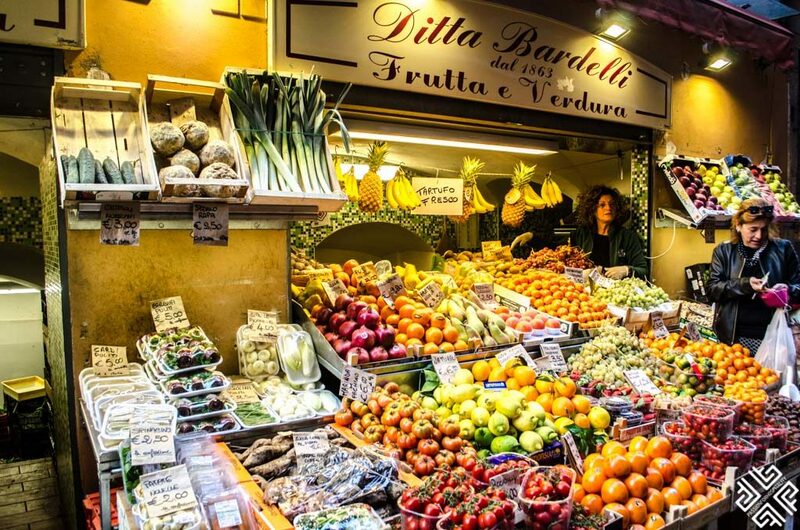 If you want to dive deeper into the secrets of Italian cuisine then how about a Food and Ferrari tour which takes you to the dairies and factories that produce the famous Italian delights.